Did You Know: There are over 27.9M Small Businesses in the United States? And the engine behind all these small businesses is made up of entrepreneurs—those who translate their passions into a viable living, those who have ideas that they’re brave enough to run with. Doers, makers, creators: Innovators in their field with huge dreams. But no matter how big those dreams are, sometimes it feels impossible to get an idea off the ground or bring your existing business to the next level. Why? Because of funding…Funding is often the most challenging hurdle for a Startup. Here we are in 2016. The entire funding landscape is in a constant state of disruption. Micro Loans, Crowdfunding, new possibilities through the recently passed JOBS Act, Angel Investors, Fast Pitch Sessions, and big Business Contests with prizes. All provide alternatives to traditional banking avenues that you’ve read about in your college business elective. At Entrepreneur Night, we pride ourselves on stimulating the right conditions each month to provide for what we’ve always described as a grassroots movement, one geared towards entrepreneurs and others who have a stake in the local business community. The idea is to create an environment in which these individuals, many of whom (but certainly not all)are just getting started, can thrive through the transaction of knowledge and business. Many of the funding options mentioned above seem, at least on the surface, to be better suited to that grass roots community. However, traditional funding methods still can work, particularly if your business is one that relies heavily on infrastructure. That’s what we’d like to talk about in this post. The Small Business Administration (SBA) is one of the nation’s oldest (dating back to the Eisenhower administration) and most trusted government agency’s created, specifically, to aid and protect the interests of small businesses across the country. Their mission, overall, is to strengthen the National Economy through the establishment and sustained vitality of small businesses. One program they offer is their 504 loan. And that is the one we will focus on for the remainder of this post. It may not be widely realized within the small business landscape, but the 504 can be a tremendous windfall. 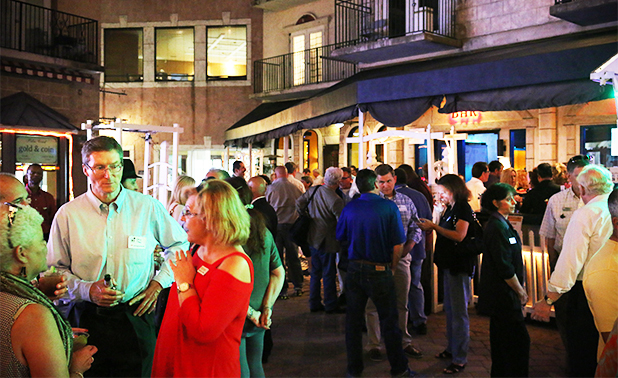 Garry Lubi was at the Flagler Beach Entrepreneur Night in March 2016. So were Natalie Hall and Donna Padgug of SBA’s North Florida District. We were grateful to see them at what is such a fast-paced and chaotic event by design, which, as such, some might assume was out of their comfort zone. Not to mention that it was a little out of their way. That notwithstanding, these ladies, both economic development specialists, love with their jobs. They help hard working folks find funding and other resources. With a little success, those individuals that they help, can then hire others—creating jobs and injecting capital into their community’s local economy while benefiting the people who live there. “98 percent of businesses are considered small businesses,” Donna added. We told Natalie and Donna that we wanted to write a blog post about the SBA 504 loans. They pointed out that SBA 504 loans have helped many small businesses. That included some that have become large, successful corporations—Nike, FedEx, Ben & Jerry’s, Under Armour, to name a few. That’s great, of course, but here’s our dilemma. Yours, too, likely, if you’re a small business person whose interest has lead you to read this far. The typical small business owner cannot relate to these companies. Those names—if you’re familiar at all with their history— you know they had no competition starting out. There were either no other companies like them or they created categories within an existing industry. Nike, for example, was one of the first to revolutionize the shoe industry with their sneakers. FedEx was the result of a Yale student’s classroom project. Ben & Jerry’s created one of the nation’s first serious ice-cream chains. Under Armour created a category based on a University of Maryland student, a football-player, who decided he didn’t like the sensation of his sweat-soaked uniforms anymore. But here is a more recent example, one that has, rightly, infatuated us: Entrepreneur Hamdi Ulukaya. Ulukaya jumped into a field already brimming with competitors. An immigrant of limited means, against all odds, he managed to secure a shut down Kraft factory in upstate New York and, with a little innovation, managed to ride out of the whole thing an inspiration. He couldn’t have done it, however, without the SBA 504 loan. That company he created was Chobani, the Greek yogurt company. Here we see Ulukaya, at the Inc. 5000 conference, describing how he put everything on the line to land that first big deal. None of his success would’ve been possible had it not been for the Small Business Administration. So if you’re a “grassroots” entrepreneur, think of Mr. Ulukaya. And don’t be too quick to dismiss establishment options outright. Kedron is a junior associate at Office Divvy and a college student at University of Alabama! He loves working with Entrepreneurs and interviewing folks at Entrepreneur Night.